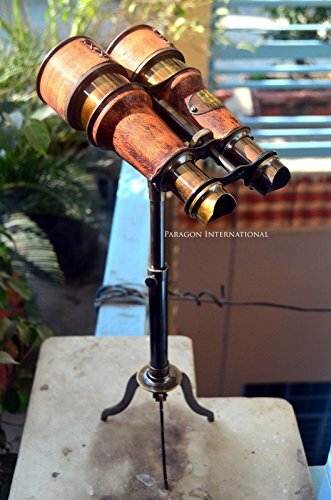 Nautical Binocular On Tripod Stand Handcrafted Brass Binocular On Brass Tripod Stand Antique Design Maritime Decorative Office Desk Decorative Binoculars Handstitched Leather Covering by Expressions Enterprises at Home Decor Outlet Store. Hurry! Limited time offer. Offer valid only while supplies last. Antique Nautical Brass Desk Decorative Binocular With Brass Height Adjustable Tripod ''ROYAL MARINE LONDON'' to Distant View a very authentic brass. Antique Nautical Brass Desk Decorative Binocular With Brass Height Adjustable Tripod "ROYAL MARINE LONDON" to Distant View a very authentic brass. This is an focus adjustable Binocular, made out of brass & Coated with Genuine leather. This is not an antique but we manufactured as same as originals. You can also set it on tables, offices etc. Best gift for vintage marine lover or those who was in Navy. You can Gift your best friend and mariner and marine lover. Desktop decorative Item. If you have any questions about this product by Expressions Enterprises, contact us by completing and submitting the form below. If you are looking for a specif part number, please include it with your message.